individual methods to satisfy the code requirements. This is in recognition of the wide variety of winter construction site conditions possible, and the fact that technology, equipment and methods of construction advance rapidly. 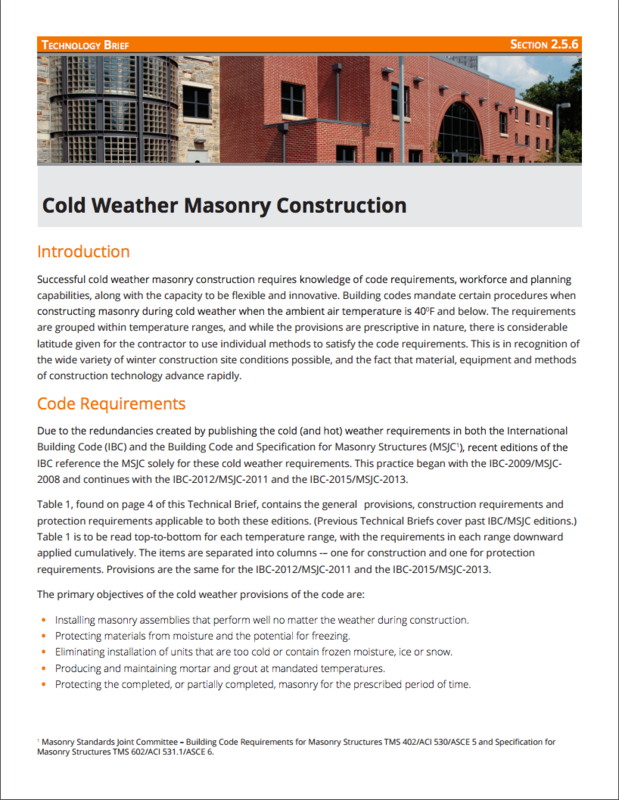 Due to the redundancies created by publishing the extreme weather requirements in both the International Building Code (IBC) and (MSJC)1, the requirements are found SOLELY in the MSJC beginning with the 2009 IBC/2008 MSJC editions. Table 1 found on page 4 contains the general provisions, construction requirements and protection requirements applicable to both IBC and MSJC from the 2003 IBC/2002 MSJC editions through the 2009 IBC/2008 MSJC. The table is to be read top-to-bottom for each temperature range, with the requirements in each range downward applied cumulatively. 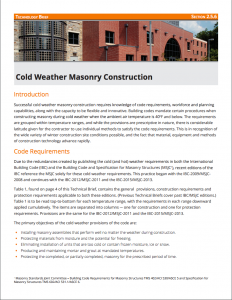 The items read horizontally separate the temperature ranges from the construction and protection requirements…..